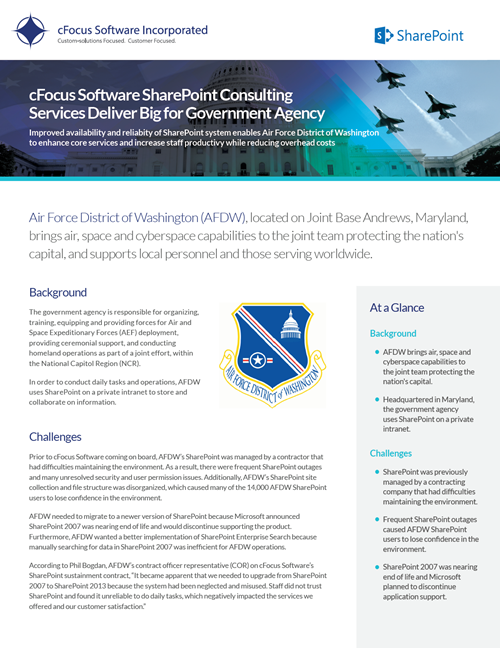 cFocus Software was tasked to stabilize, manage and support Air Force District of Washington’s (AFDW)’s SharePoint environment as well as perform a major SharePoint migration from SharePoint 2007 to SharePoint 2013. As a result of cFocus’ SharePoint work, AFDW can now operate efficiently and effectively without, frequent SharePoint outages. With the implementation of SharePoint 2013 Enterprise Search, AFDW’s staff saves time by eliminating the need to manually look through shared drive directories for data. With all of their SharePoint issues resolved, AFDW promoted SharePoint to a core service and its SharePoint users’ confidence has been restored. Please click on the document to launch the case study in Adobe Acrobat.